Now that the spreadsheet of transactions (we have 235 transactions so far) is already shared with them as per their instructions, we are now waiting for the manually processing of those transactions. We had to depend upon the emails at support at unocoin.com and calls that we have received at the customer care toll-free number to prepare this spreadsheet. If we have missed any of your deposits as well, please send an email to support at unocoin dot com so that we can send the info to BitGo and have them fix it for us. Due to the fact that we had launched ZIL tokens on our platform on the same day (Friday evening), the deposit issue really created a liquidity crunch at Unocoin which sent its last traded price to 6x of other exchange prices (though depth and volume were not there). This made more and more of our users to deposit ZIL (while we were still figuring out the deposit issue) and these have also got stuck and have aggravated the issue than what it already is supposed to be. 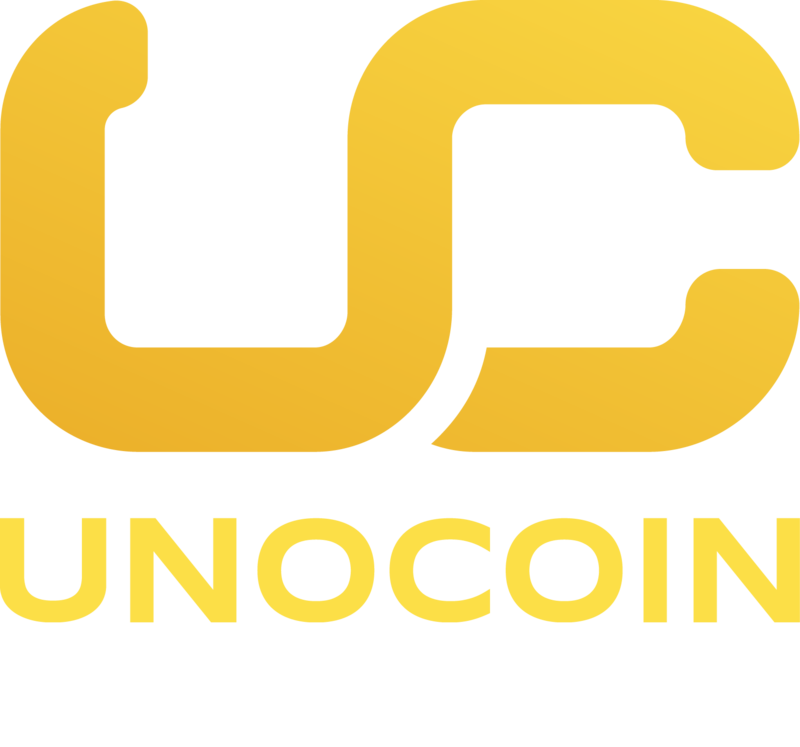 All new deposits and all other types of transactions are happening on Unocoin without any issue. Now, we are left with these 235 struck transactions from Friday evening to get sorted out. We are working with BitGo and hoping that we get some help from them during the weekend instead of them making us wait until their Monday. This is the first time we have faced an issue from BitGo at this level. The sad part is, there was no public announcement or any notice from them during or even after the event – else we could have delayed the listing of ZIL tokens. While we do not want to push the blame on our 3rd party service provider, we are equally helpless as we are not able to directly help our customers who are facing the issue. We request our customers whose deposits are struck to be patient and help us to get these sorted out. The inconvenience is deeply regretted. Update at 4PM on 20th May: It has been 24 hours since we sent the list of missing transactions to BitGo. We have sent two follow up emails and also tried their hotline number in these 24 hours but to no vain. It looks like their engineers who need to manually trigger the insertion of missing transactions into their wallets and catalogue them won’t work during weekends (I wish they worked during weekends at least when they have such huge problems) and their customer care personnel cannot really do this for us as it is technical in nature and they may need to meddle with their database etc. So – likely we will have to wait for their Monday morning (which will be Monday evening Indian time to get these 235 transactions sorted out). We shall apply a 200 INR worth coupon in BTC to all the customers who got affected once we get the issue sorted out. We hope that this will at least make up for the fee our customers paid at other exchanges or from wallets when they transferred the tokens to Unocoin. We also will be paying the mining fee for ZIL when you transfer it out during next few days. We apologize for the trouble caused due to the delay of deposits. We are doing our best and continue to do our best to get this sorted out at the soonest possible. 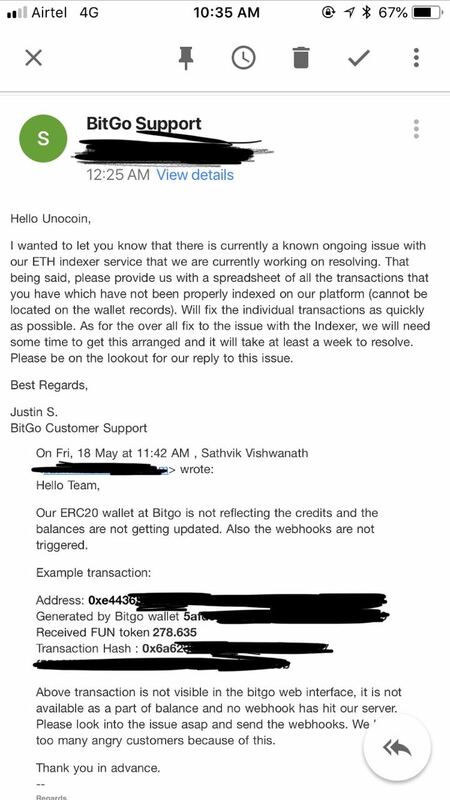 Update at 9PM on 20th May: We heard back from BitGo customer care and they have assured that they have taken the sorting out of these transactions with the highest priority and will be taken care as soon as their engineers become available. Update at 6.30pm on 21st May: Our engineers designed a turn around solution and have credited all the pending deposits that were reported to us till 6.30pm today. All these affected users have also been given 200 INR worth of coupon code applied directly on their BTC wallet account. We are considering the issue to be solved. We apologize for the inconvenience caused. Thank you.